I have a Chicago Coin "Top Ten" that I recently picked up. It's missing one flipper assembly and both flipper button assemblies. It worked good, but I just couldn't flip on it. I'm waiting for these parts to arrive to make it a complete game. The usual rule is, you messed with something, now it doesn't work, go back to what you messed with, but in this case, that's going to take awhile. You have the bane of EMs. The switch that appears to be making but really isn't. Without the schematic no way to know what you're looking at here. I don't like the approach of cleaning every switch to ferret out a problem (mostly for this reason). That said, it's done, so how to fix? The lock relay, tilt trip relay or game over relay are what I would look to for lack of coil power. Which switch? Good question. 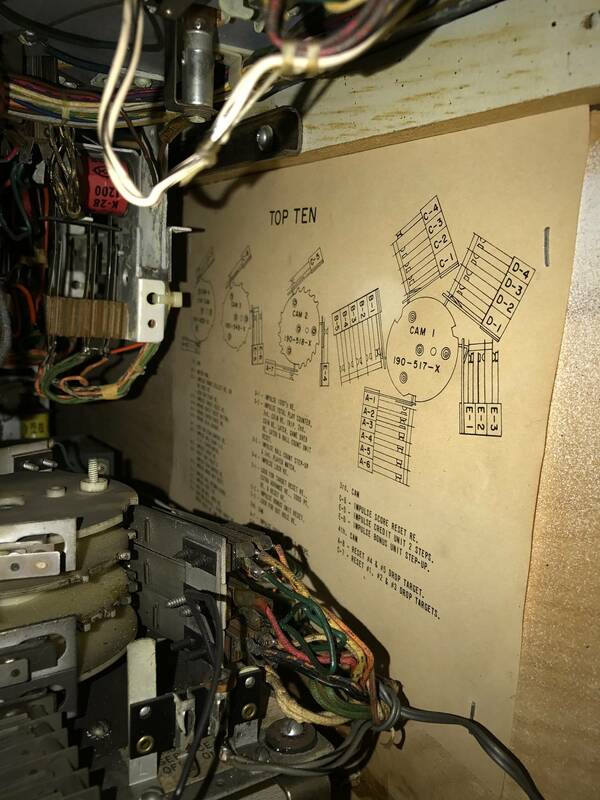 You're gonna have to shotgun it to find it (unless you have a schematic). How are your fuse holders? Clean and tight? After digging into it for a minute, I started with activating the tilt relay coil by hand a few times. The game has played fine for about 10 straight games after that. Sweet! Now I just have to figure out why the scores don't fully reset when starting a new game. They turn over 3 digits then it kicks the ball into the shooter lane. That's usually zero position switches on the score reels, but hey, I don't know if you messed with those or not. But something is telling the game that reset is complete, so that's a starting point. Do you have the schematic? i didn't mess with the score reels or anything else in the back box. The scores did reset completely before I cleaned all the cabinet switches. I do not have a schematic. Only the parts catalog and this paper on the inside of the cabinet.